I came back from my friend Sapna Jain’s store called the East India Company. You can almost find “anything” that is needed for South East Asian cooking. And since Sapna is getting more into organic my grocery bags are getting heavier every time I visit her. On my last visit to Sapna’s I bought in organic Kamut flour as well as some other unique flours, nuts, seeds and superfoods from her. After getting the flour I have been waiting for my mom to come and stay with me. Well as hubby away in Bangladesh for 10 days I found the perfect opportunity to wake up early in the morning make chapati with Ammu (my mother)! So it is the simplest recipe I have shared with you as far as ingredients are concerned however processing is difficult because not everyone can make their roti or chapatti round! It’s an art! So, I made two which were not the best round ones but the rest were made by Ammu. A grain derived from an ancient Egyptian variety of wheat. It has large kernels that can be ground, processed into flakes or cooked whole. Nutrients: Vitamin E, Vitamin C, Niacin, Magnesium, Zinc, Selenium and Manganese. Kamut is also high in dietary fiber. Salt: Ammu used salt in water to cook the kamut flour or “atta” in a pot. Cooking the flour: She believes in cooking the kamut flour before making the roti or chapatti. In Bangla (our native tongue) she uses the term “atta kai kora” or to cook the four before kneading the dough in warm water. 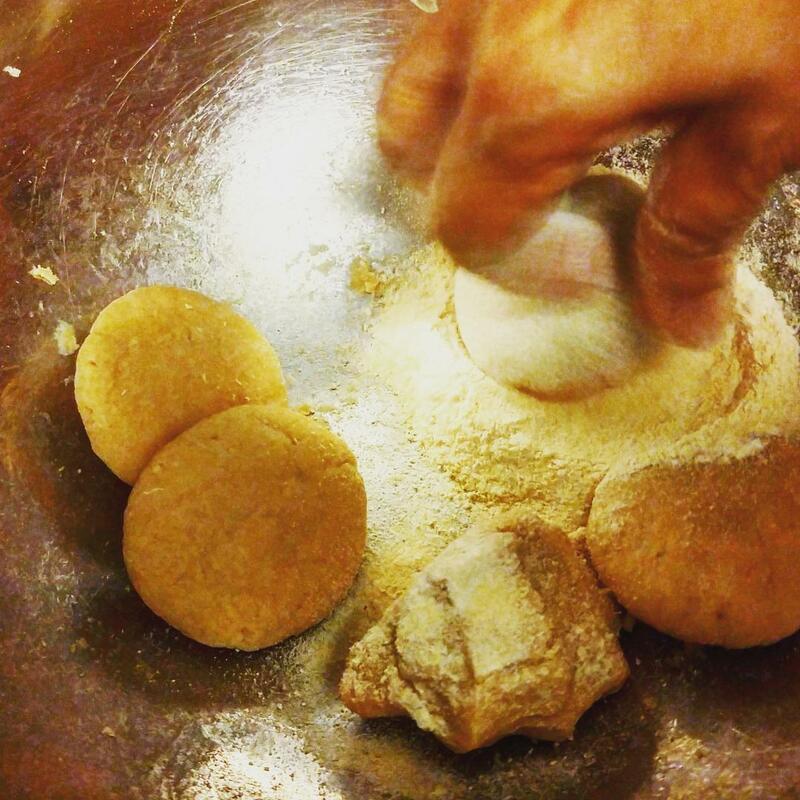 Adding spice: We used a spice to make the roti taste great and have a medicinal value added to it. Keeping extra: Keeping extra flour in hand for dusting the roti while making it. When rolling the chapati – keep on rotating it every few seconds to make it round. Belon! Or the Rolling Pin. I got mine from Bangladesh. Piri or the wooden flat round platform to roll the chapatti. In a pot bring water to boil and add salt. Pour in the flour and mix the flour in water. Add the nigella seeds to the flour. Keep on mixing until nice dough like consistency is formed. Transfer the mixture in the mixing bowl and start kneading with your hands. Form dough and then roll it lengthwise. Cut the dough into smaller portions to make 10 small balls. Using the palm of your hand flatten the dough. In a small bowl keep the extra flour and dip the dough in it. Sprinkle more loose flour on the rolling platform or piri. Place the dough on the piri and start rolling using the rolling pin. Keep on moving or rotating the dough so it become round. Sprinkle more flour if you feel the surface is getting sticky. Get all of the raw roti ready and place them on a plate. On a stove top – place a flat pan on the stove and let it heat up. Flip and wait for the same. You may see the roti fluffs up like a mini balloon – keep it like this for a few seconds and then turn. This is a really good sign.